Solar System Pin Cushion by Claire Payne. Congress Reduces Solar System due to a Budget cut. Click here to find out why come our Solar System has such a generic name. Planet Personalities: The distinctive personalities of the planets as expressed in the style of contemporary business or community webpages - created by Robert Lander. The Fate of the Universe - poem by Leslie C. McKinney, Ph.D.
Cick here to find out who babysits the Solar System - a cartoon by the Awkward Yeti. Click here to see who cares for the pets of the Solar System - another cartoon by the Awkward Yeti. For sale on Chain of Being Etsy shop. For sale on Chain of Being Etsy shop run by Laura and Jeremy in Alameda, CA. Interview with Planetary Society's Emily Lakdawalla. Planetdoku is a solvable sudoku made with planetary signs. 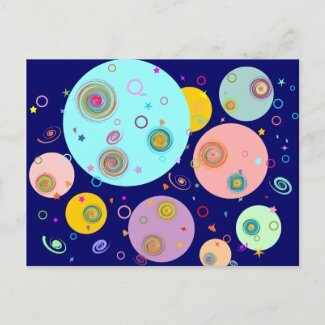 Solar System LP art print by Ramses Pujol. 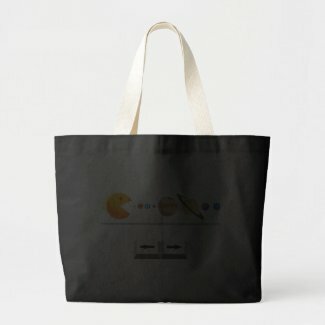 On his society6 page. This is funny only if you remember what an LP is. Send a free e-card from various planets. On Bill Nye's website. Learn some astronomy history from this art print: Astronomy 101 by Budi Satria Kwan. On his society6 page. Tyler Nordgren, author of 'Stars Above, Earth Below: Guide to Astronomy in America's National Parks', designed "U.N. Department of the Exterior Planetary Park" posters in the style of the iconic 1930s WPA posters for America's National Parks. Available from his website. Over 12,000 photos in this on a Flickr group. Space Alphabet fabric by Jennifer Wambach. 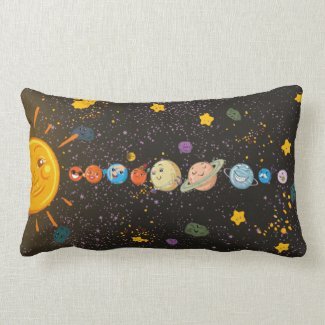 Solar System made of felt. by Fritz Ahlefeldt. His website: ww.ww.HikingArtist.com. He has lots of environmental drawings most of which he allows others to use. Heliocentrism Day is celebrated on February 17th which is between the birthdays of Galileo (15th) and Copernicus (19th). Here is a photo of cupcakes made to celebrate this day. The planets are portrayed as people racing around the Sun. Source: "The Book of Knowledge' (published by Arthur Mee in 1912 - click here to learn more). The planets play music on an imaginary huge piano.